There were high expectations surrounding this year’s Nintendo E3 Press Conference. Justin, Cole, Ethan, and Josh examine the Wii U features, 2D Mario games, plenty of Pikmin, and what the future of Nintendo looks like from here. 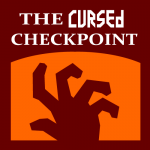 The Cursed Checkpoint is a topical video game podcast focused on discussions and interviews about a single video game, genre, news headline, or industry story. It features a rotating cast of up to 3 members of the Horrible Night writing staff and/or video game industry professionals. 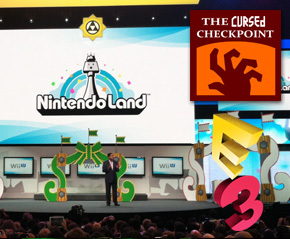 This checkpoint serves as a recap of the E3 2012 Nintendo Press conference. It is for is intended for anyone who watched the event or who is interested in any of the major games or news items from the event. This is the second episode in our E3 2012 press conference coverage. Join us throughout the week as we take a look at the major press conferences and gaming news. This will be followed up with a live summary show with 2012 predictions next week. Subscribe to The Cursed Checkpoint – Multiple episodes a month.